Breadalbane Academy's winning team (left to right): Ben Cowan (also individual scratch champion), Duncan McBride (individual handicap champion), Jolsh Dolzanski and Cameron Slater. 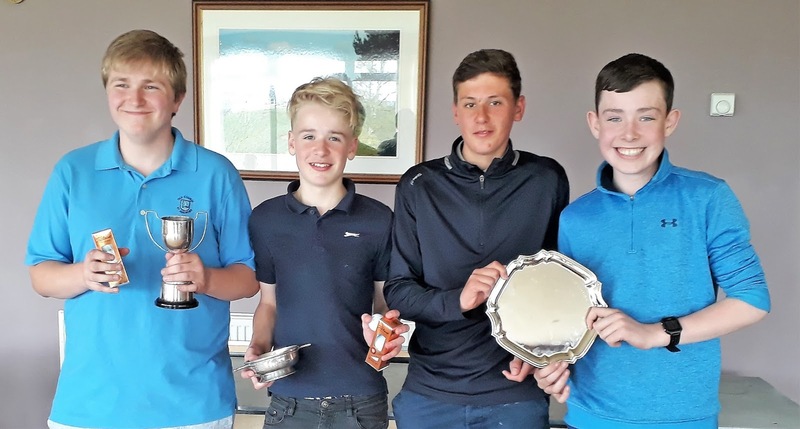 Pupils from Breadalbane Academy were the star performers in the Perth and Kinross schools golf championships at Alyth Golf Club today. The boys’ individual champion was Ben Cowan who last year won the handicap prize. He produced an outstanding scratch round of 74 to win by three strokes from school colleague Jolsh Dolzanski. Third form boy Ben will have further chances to play in these championships and will surely reduce his current handicap of 10 to low single figures by the next time he plays in this event. The team championship was won by Breadalbane Academy with a consistent team performance. The girls’ championship was won by Shannon Pook (Strathallan School) with a round of 88. She won by three strokes from Glenalmond College boarder Antonnia Heckmanns who hails from Germany. The handicap event was won by Duncan McBride (Breadalbane Academy) with a net score of 67 off a handicap of 18. The Schools’ Association committee would like to thank Alyth GC for hosting the event and for having the course in such good condition after the very cold conditions we have all experienced through this late Spring. Secondly, thanks must go to the clubhouse staff who provided ideal catering for the event.